The proposal was for a full refurbishment, and re-ordering of an existing extension to a Grade-II Listed Semi- detached regency villa. 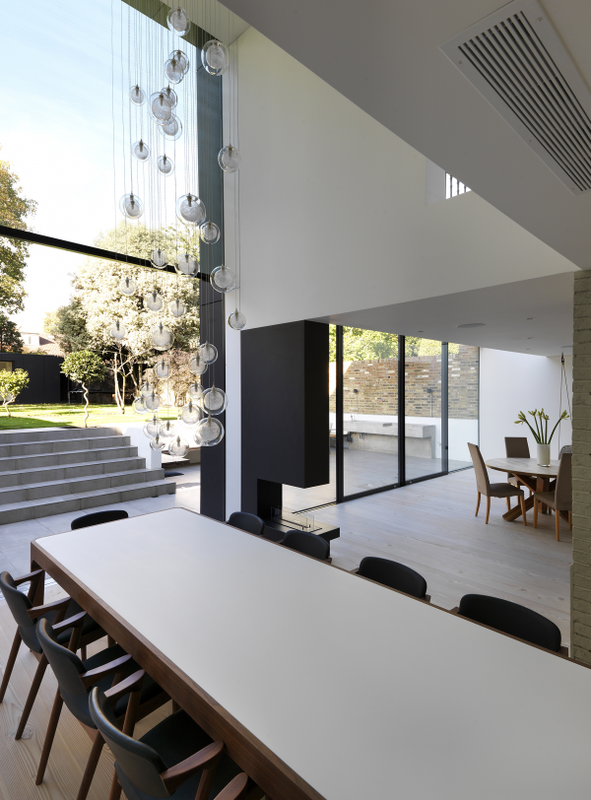 The client had expressed a desire for a much simpler and ordered internal layout to a large family house which had suffered many different iterations and alterations resulting in lots of small internal level changes, and an extension of contemporary design suited for modern living. 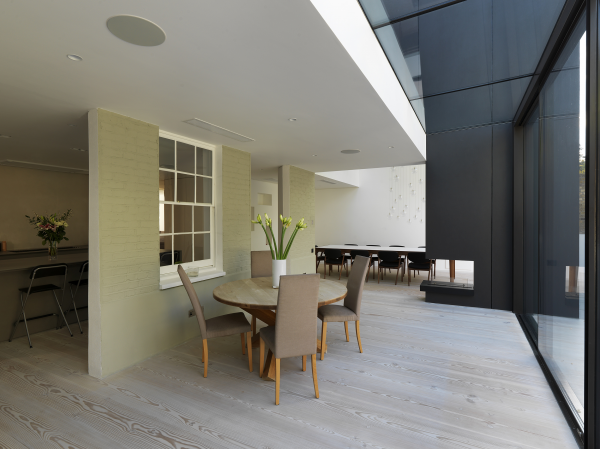 The clients wanted a scheme that provided a large and very open space for the family to convene, eat, socialise and relax together on the ground floor. They also asked that the relationship between the rear of the house and the garden be improved. 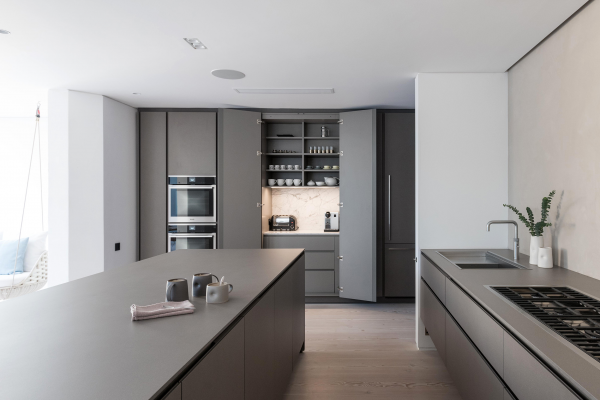 Our main focus was to work around the disjointed existing social spaces, to provide the client with flexibility and simplicity, whilst in keeping with their contemporary tastes. A spacious open planned scheme was developed, and a strong visual connection with the garden introduced. The appearance and finish of the property was a clean and contemporary style. An element of seamelessness is emphasised on the basement floor by the continuous floor boards which also helps to maintain the clean and crisp aesthetic. The lower ground floor had suffered a series of alterations in its history, some of which were difficult to trace. 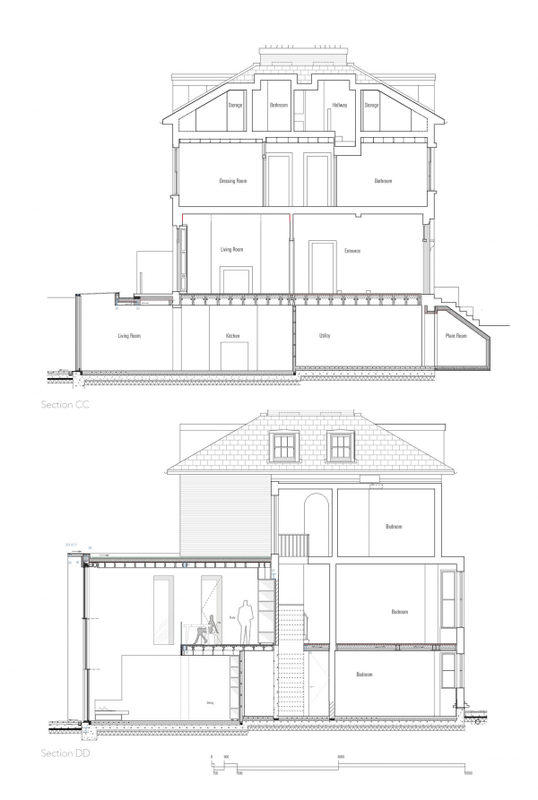 It resulted in many awkward and disorganised level changes, as well as highlighted in the existing lower ground floor plan, which the client wished to level. 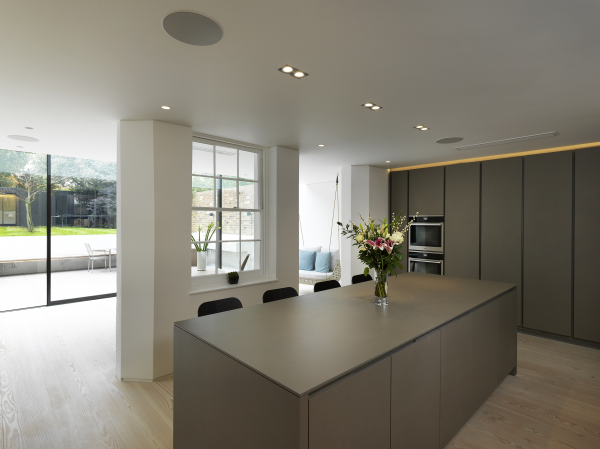 We worked closely with the client and kitchen designer to design and deliver the bespoke kitchen and dining table, and the client was completely involved in every stage of the project from conception to completion. Coming from a creative/design background, she frequently told us how much she enjoyed the development of the design and the construction process. The relationship with the client became symbiotic, essential to the successful outcome of the scheme and its resultant aesthetic. 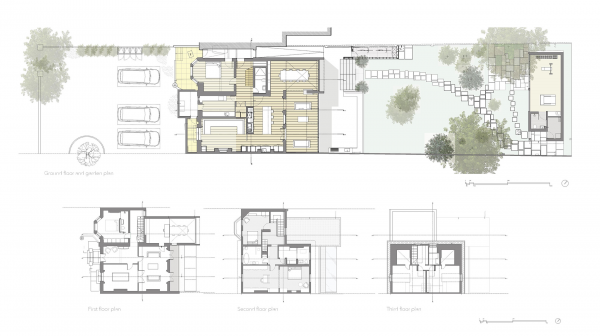 The property falls within in a Conservation area that puts limitations on the scale of development, and in particular, upholds the vernacular of residential architecture. That rendered the front of the house untouchable for anything more than renovation and upkeep, and focused our work on improving internal layouts and a large rear extension to replace the existing one. 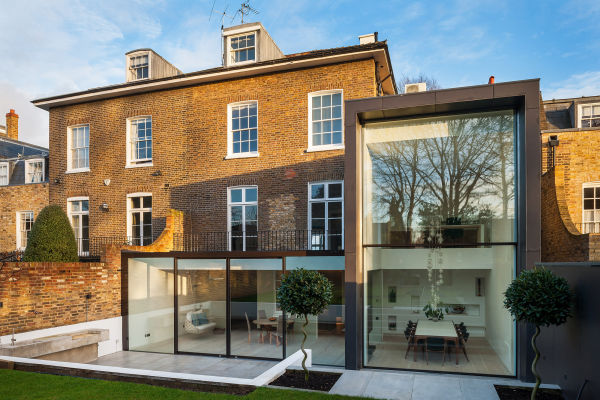 Ours would be a much more contemporary addition, in keeping with both the clients, and Hogarth Architects’ style. One of the primary aims for the project was to upgrade the existing structure to the best possible standard of energy efficiency for a historic building, whilst avoiding the loss of any significant features of the historic fabric. The scheme employs both well-known, passive techniques to lower the building’s energy consumption, as well as new, innovative technologies. The external fabric was upgraded where possible with internal insulation whilst the new rear extensions at lower ground floor and upper ground floor levels where built with a high standard of insulation and air tightness. Any thermal bridging was eliminated from the design by strategic placement of insulation around junction details. Additionally, the glazing to the double height sash window and the sliding doors have been installed with solar control coatings which maintains a high level of light transmission whilst reducing the G factor of the glass so as not to overheat the spaces during summer months. 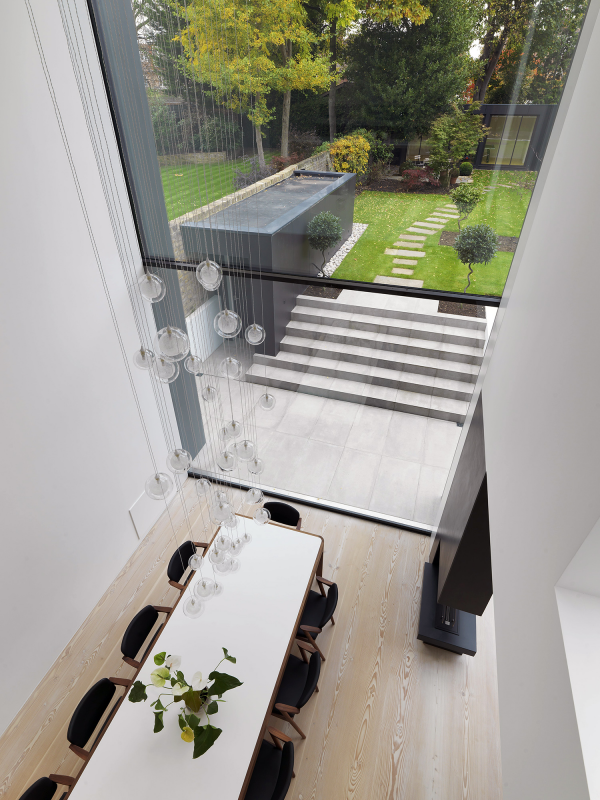 The glazing also provides the opportunity for natural cross ventilation throughout the house and an abundance of natural light. 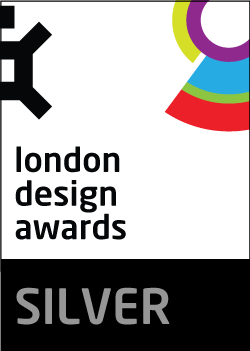 Finally, the scheme benefits from a newly installed whole house ventilation system which filters the polluted London air and reduces the humidity levels eliminating the damp, condensation and mould problems suffered by the house prior to the renovation.